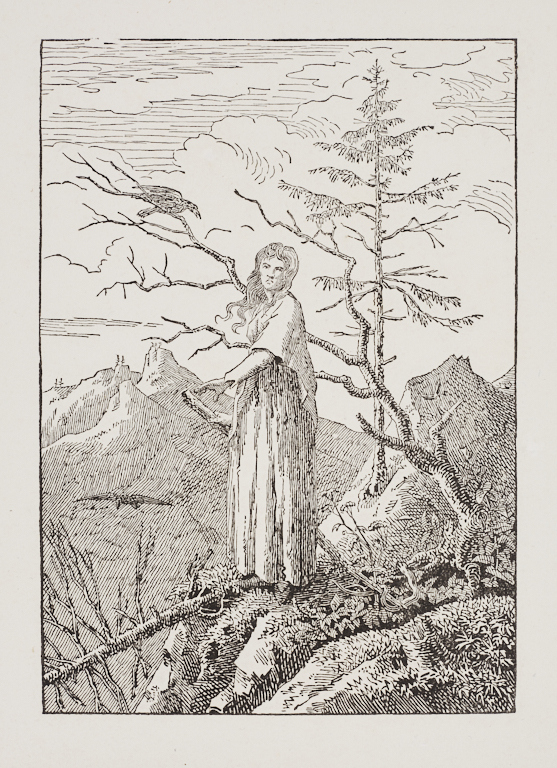 One of only four woodcuts credited to Caspar David Friedrich, the undisputed master of German Romanticism, The Woman with the Raven at the Abyss shows the close connection between landscape and human emotion in Friedrich's art. Standing at the edge of a deep chasm, a woman turns toward the viewer, surrounded by emblems of transience, isolation and death: fallen trees, craggy peaks, two ravens, and a snake winding menacingly on the ground. Probably intended as an illustration for a book of Friedrich's own poems, the design was cut into the woodblock by Friedrich's brother, a cabinet-maker by trade. Makholm, Kristin. Nineteenth–Century German Prints and Drawings from the Milwaukee Art Museum. Milwaukee, Wisconsin: Milwaukee Art Museum, 2002, p. 34, cat. 4, b/w illus. p. 12. Framing a Decade: Acquisitions of Prints and Drawings, 2001–2011, Milwaukee Art Museum, Decebmer 9, 2010–April 3, 2011. Romanticism to Impressionism: Nineteenth–Century German Prints and Drawings from the René von Schleinitz Memorial Fund, Milwaukee Art Museum, May 24, 2002–August 11, 2002.